Click on an image to go directly to a system or scroll to see the systems in this gallery. View/Sys/Gal: Ode "2D: p. 99 (-x,y+k*x^2), k = .00; " in "PerkoExs." The problem is to find the separatrix system for k = 1.
where the separatrix system is easy to find, to the nonlinear system, where it is not so easy to find, will be used. 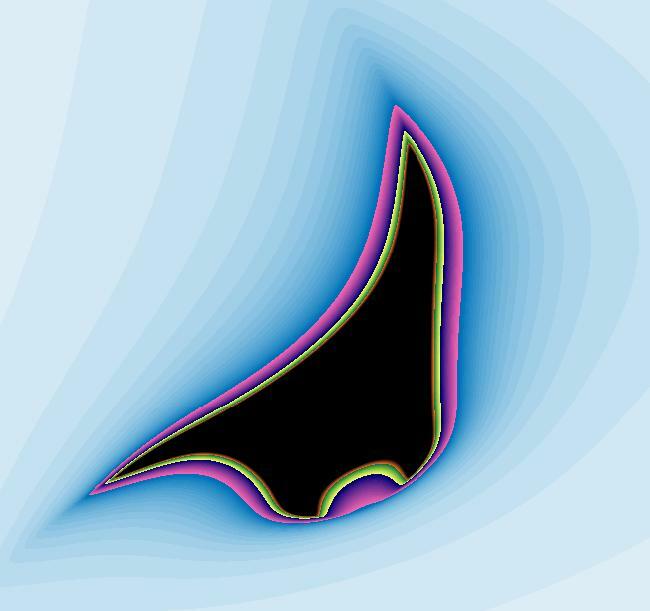 An inspection of the vector field for the linearized system shows that the axes form the separatrix system. λ2 = 1, v2 = (0,1). The separatrices and the fixed point partition the phase space into four open regions called components. The four black trajectories starting at (+-1,+-1) are generic trajectories in each of the four components. The R2+ view is the global phase portrait and it contains all there is to know, gualitatively, about the system. To see the separatrices for the linear system morph into the separatrices for the nonlinear system, click the "Adj Ctrl Params..." button and adjust k from 0 to 1. Also try adjusting k from 0 to -1. For a 3D variation of this problem, see the 3D p. 105 systems in this gallery. View/Sys/Gal: EMap "2D: p. 99 (-x,y+k*x^2), k = .00; EMapCT3" in "PerkoExs." View/Sys/Gal: Ode "2D: p. 102 (-2*y,4*x*(x-1)*(x-.5))" in "PerkoExs." The goal here is to find the finite and infinite fixed points and the separatrices. 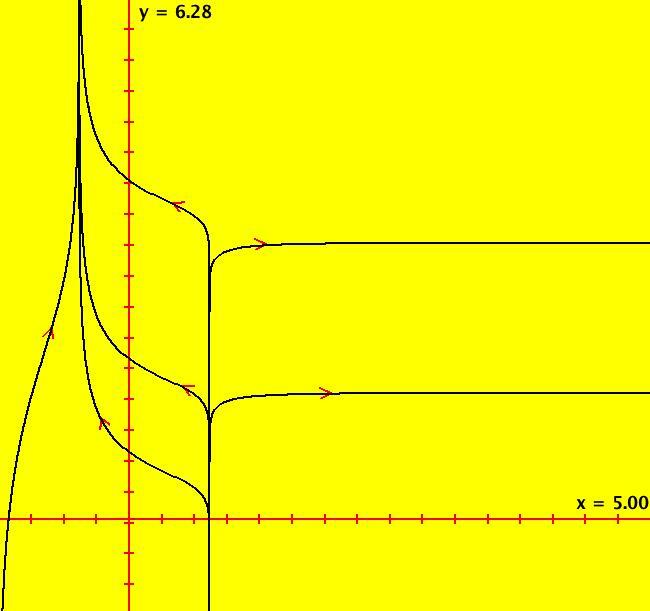 verify that they are indeed solution curves by plugging them into the differential equations. are four additional fixed points at infinity. The x > 1 parts of the two straight lines are separatrices. 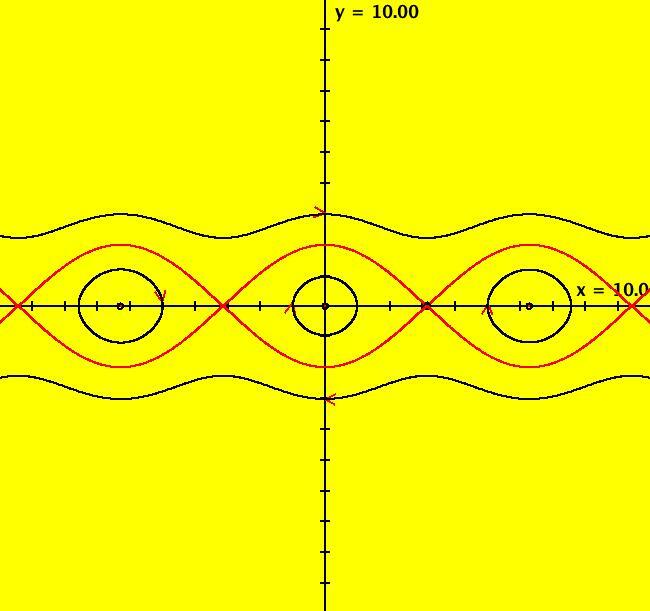 The separatrices are the 7 red curves emanating from the 2 finite fixed points. The 7 separatrices, shown in red, together with the two finite fixed points, partition the global phase space into 6 components. A generic black trajectory is shown in each component. ICs of (-1,+-.00001) and (-1,0) give the first 4 separatrices. ICs of (1.001,+-.001) and (1.001,0) give the other 3 separatrices. Switch to the R2+ view to see the global phase portrait. To convince yourself that the separatrices do partition R2+ into 6 components, start additional trajectories in each component and note that the new trajectories in each component are topologically equivalent to the generic trajectory in that component. Try the EMap view with various color tables. View/Sys/Gal: Ode "2D: p. 111 (-x-a*y^2,y+a*x^2), a=0" in "PerkoExs." While in the R2+ view, adjust parameter "a" to watch the separatrices for the system change as it becomes nonlinear. 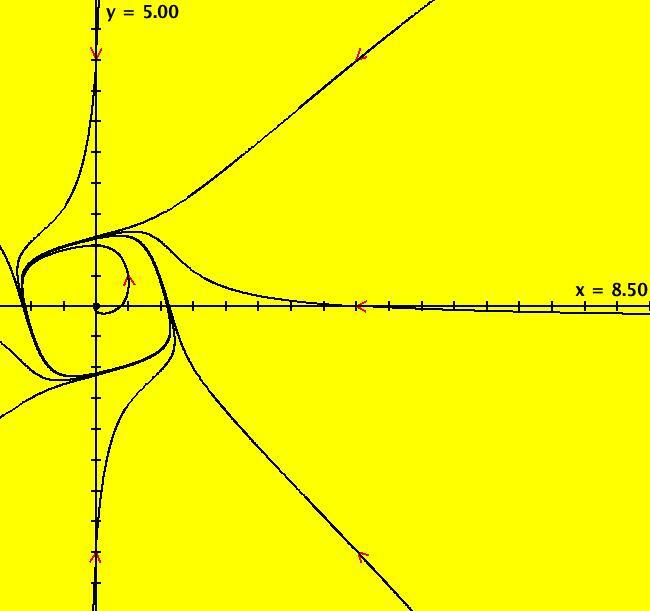 View/Sys/Gal: EMap "2D: p. 111 (-x-a*y^2,y+a*x^2), a=0 EMapCT3" in "PerkoExs." View/Sys/Gal: Ode "2D: p. 111 (-x-y^2,y+x^2)" in "PerkoExs." In this example I will demonstrate another way to study the "a = 1" case of the previous example. (x,y) = (0,0) and (-1,-1). 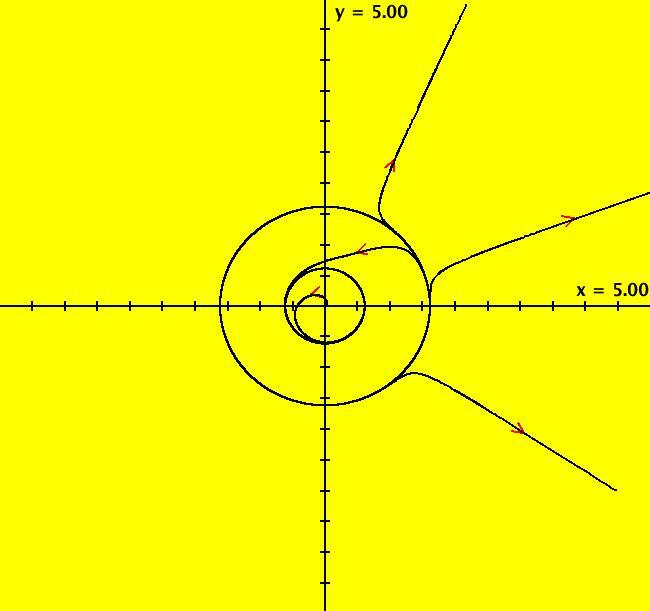 Viewing the vector field, it looks like the straight line y = -x+1 is a solution (you can verify this by checking to see if dy/dt = d(-x+1)/dt when y = -x+1, which it does). gives us the fixed points at infinity. gives the fixed points at infinity. 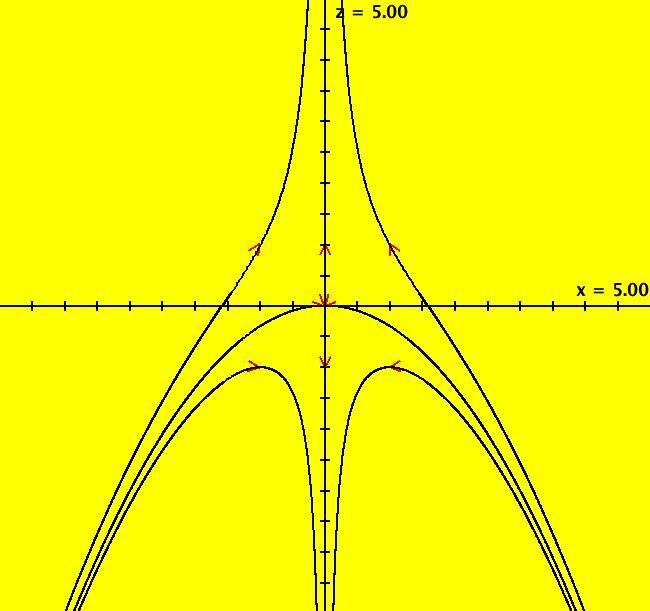 Approximate (local) separatrices at (0,0) can be found by solving an integral equation by successive approximations. This algorithm is demonstrated in the proof of the "Stable Manifold Theorem," Perko, p. 108.
x ~= -(y^2)/3 + O(y^5). For this example, there are three ways to draw the approximate separatrix system near (0,0). (1) The hard way: we could use the equations given above to start four trajectories on the stable and unstable manifolds near (0,0) at (+-.1,-.003333) and (-.003333,+-.1) respectively. (2) An easier way: since the fixed point is a saddle loop, we could start a single trajectory in a saddle, near (0,0), outside of the loop at (-.005,0). Try this by clearing the view and starting a trajectory at (-.005,0). Zoom in to see where the trajectory actually goes. (3) The easiest way: move the cursor over (0,0) to draw the fixed point solution (a small open circle appears) then with the cursor in the circle, hold the shift key down and wiggle it a bit. This method is fast, but generally too crude. It can produce more approximate separatrices than you want. Give it a try. The first method was used to draw four black trajectories near (0,0) with arrowheads and the second method was used to draw a red trajectory on top of the black trajectories. To see the black trajectories, click on (0,0) and delete the red trajectory starting at (-.005,0). The three separatrices are the red loop and the two red half-lines. Together with the fixed point at (0,0), they partition the phase space into 3 components. Adding the 3 representative trajectories in the 3 components gives the global phase portrait. See the R2+ view. The red loop plus the fixed point is called a separatrix cycle. View/Sys/Gal: EMap "2D: p. 111 (-x-y^2,y+x^2) EMapCT3" in "PerkoExs." 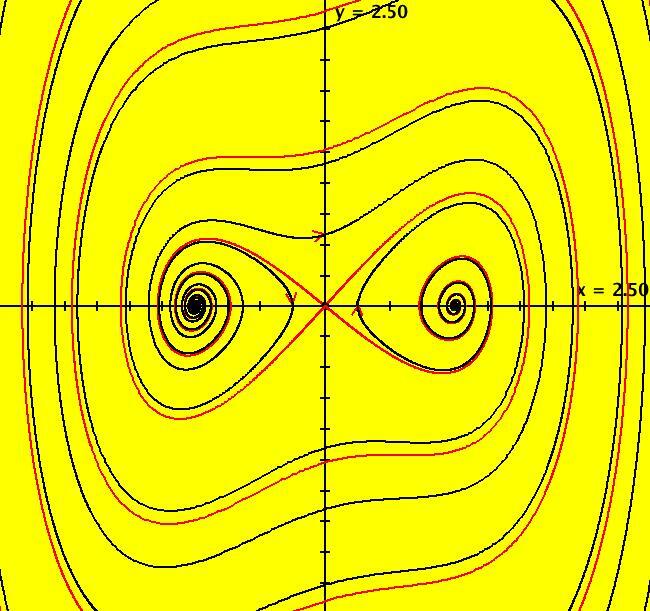 View/Sys/Gal: Ode "2D: p. 141: (x+2*y+a*(x^2-y^2),3*x+4*y-a*x*y), a=0" in "PerkoExs." In the R2+ view, you can watch the four fixed points at infinity move on the unit circle as you adjust "a." View/Sys/Gal: Ode "2D: p. 142: (-x-a*y/F,-y+a*x/F), a=0, F=ln(sqrt(x^2+y^2))" in "PerkoExs." See the IMap and EMap views for a = +-0.27. View/Sys/Gal: EMap "2D: p. 142: (-x-a*y/F,-y+a*x/F), a=0, F=ln(sqrt(x^2+y^2)) EMapCT6" in "PerkoExs." 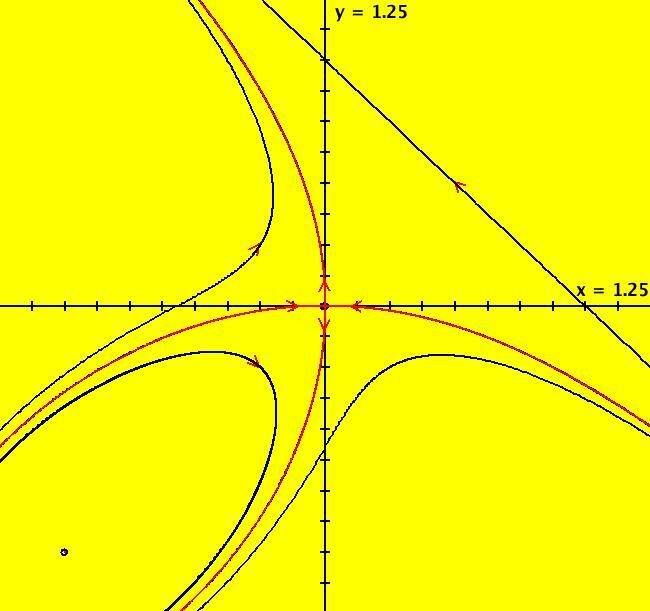 View/Sys/Gal: Ode "2D: p. 143: (-y+a*x*F*sin(1/F),x+a*y*F*sin(1/F)), a=0, F=sqrt(x^2+y^2)" in "PerkoExs." Adjust "a" in the Ode view. Toggle to the IMap view then get into the 3D/(x,y) subview and adjust "a." 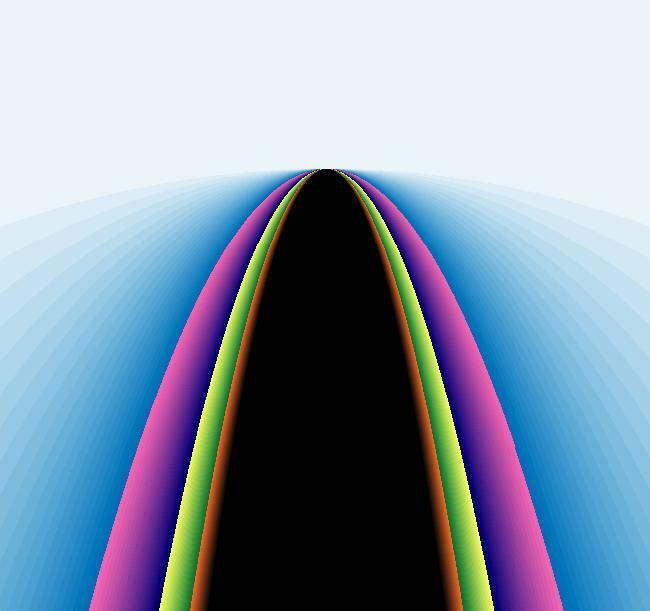 View/Sys/Gal: Ode "2D: p. 172 (y,-(x+a*(sin(x)-x))), a=0" in "PerkoExs." 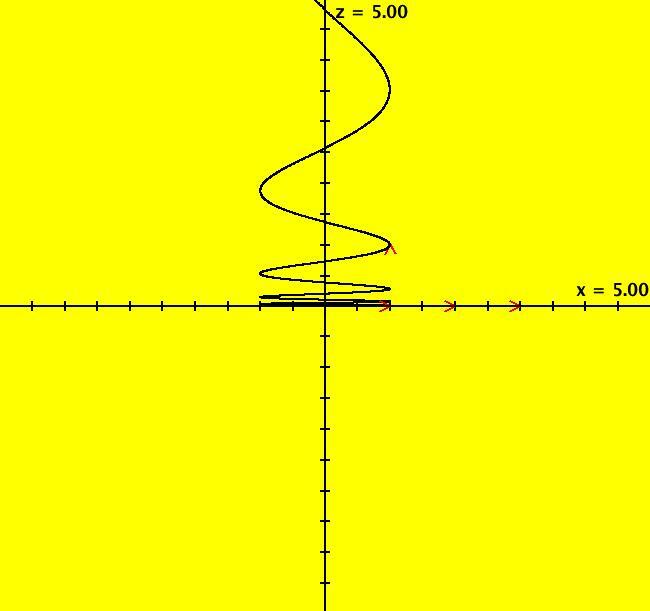 dx/dt = y, dy/dt = -sin(x). n = odd gives a saddle. To draw the approximate saddle separatrices near (odd*pi,0), for the a=1 case, ICs of (+-pi,0). The other ICs are (0,1) and (0,+-2.5). Slide "a" from 0 to 1 to see the separatrices appear. In the IMap view, all orbits are cycles (squares) for a = 0. 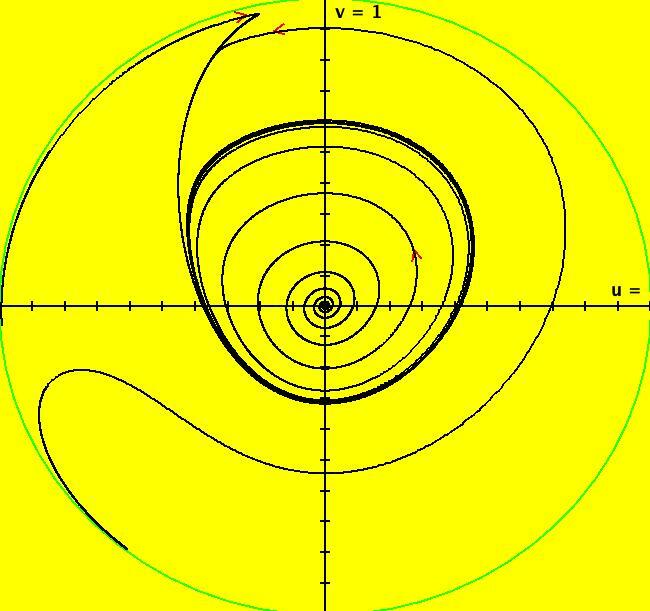 For a > 0 all orbits spiral to (0,0) and spiral out to infinity for a < 0. The motion is cw. Try the EMap view for a = -.5 zoomed in once. 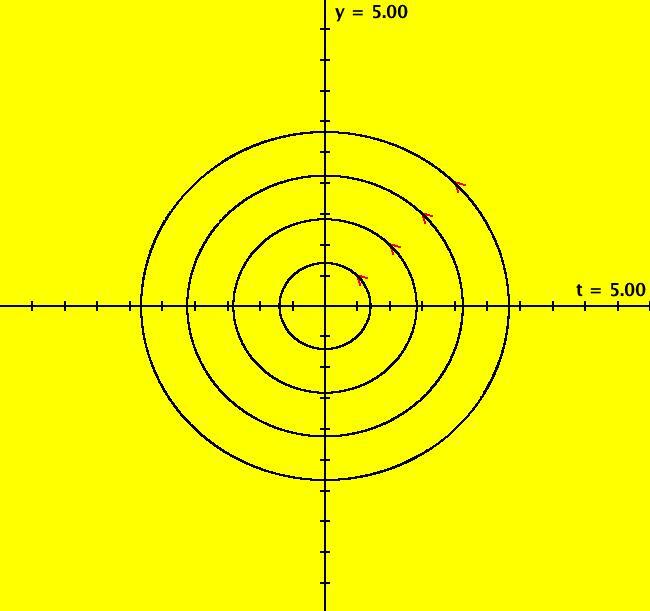 View/Sys/Gal: Ode "2D: p. 172 (y,-sin(x))" in "PerkoExs." 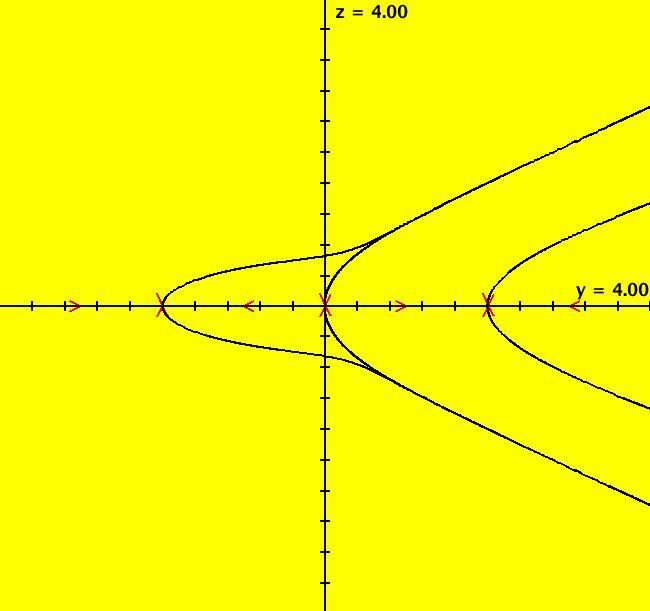 in the (t,x,y) coordinate system. All of the separatrices can be drawn by using just two ICs (pi,+-.0001), in the saddle, just above and just below the fixed point at (pi,0). The fixed points at infinity accumulate at (u,v) = (+-1,0). 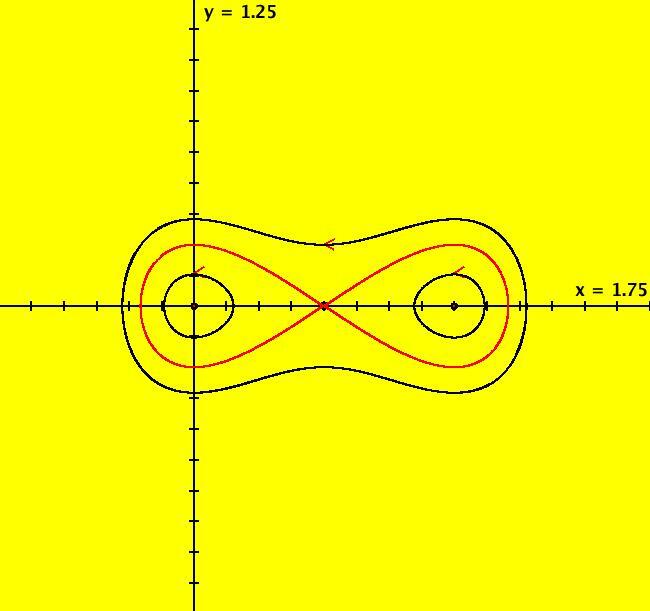 The separatrices are the infinite number of top and bottom sets of red curves not including the fixed points. Each "eye" is a separatrix cycle. The phase space has an infinite number of components consisting or the two regions above and below the red curves and the infinite number of "eye" shaped regions. Generic trajectories in a few of the components are drawn in black. View/Sys/Gal: Ode "2D: p. 175 (-4*x*(x-1)*(x-.5),-2*y)" in "PerkoExs." It is called a gradient system. where "dot" is the dot product of the two vectors. is called a Hamiltonian system. The vector field for the corresponding gradient system, (-Vx,-Vy), and the vector field for the Hamiltonian system, (Hy,-Hx) = (Vy,-Vx) are orthogonal so the trajectories for the two systems are orthogonal. 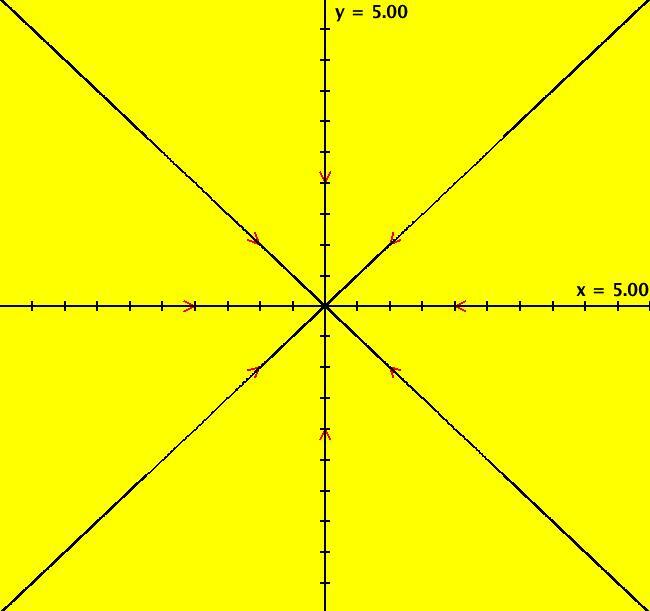 The 3 finite fixed points are at (x,y) = (0,0), (.5,0) and (1,0). 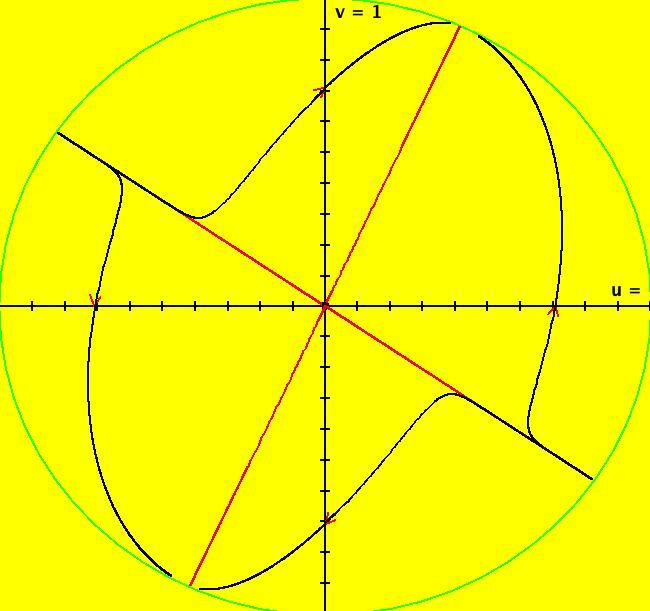 For the system under consideration, the 4 fixed points at infinity are at (u,v) = (0,+-1) and (+-1,0). The 10 separatrices are the 6 red vertical half-lines at x = 0, .5, 1, y != 0 and the 4 red segments of the x axis separated by the 3 finite fixed points. The separatrices partition the phase space into 8 components. View/Sys/Gal: Ode "2D: p. 176 (-2*y,4*x*(x-1)*(x-.5))" in "PerkoExs." is called a Hamiltonian function. This is the companion system to the gradient system of the previous example. Fixed points at infinity: none. Separatrices: the two red loops. Separatrix cycles: the two red loop joined at the fixed point (1,0). The trajectories of this system are orthogonal to those of the previous system. The global phase portrait has 3 components. View/Sys/Gal: EMap "2D: p. 176 (-2*y,4*x*(x-1)*(x-.5)) EMapCT9" in "PerkoExs." This is a very strange fractal. View/Sys/Gal: Ode "2D: p. 247 two limit cycles" in "PerkoExs." Looks like limit cycles at r = .609, 1.605. 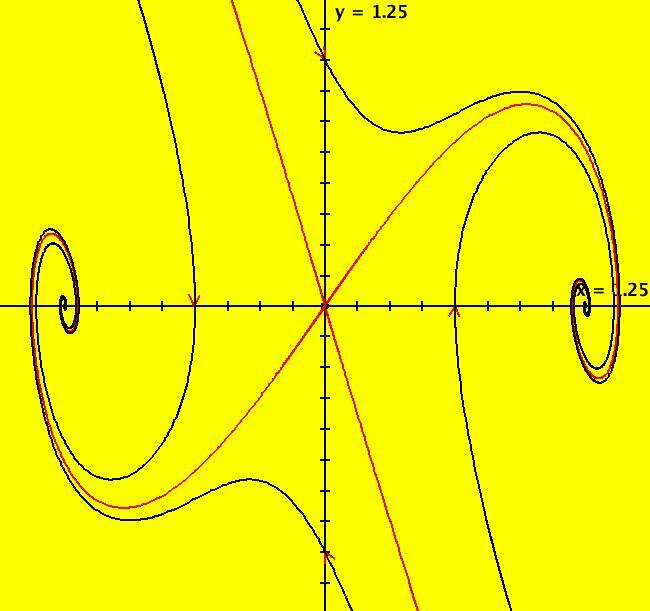 View/Sys/Gal: Ode "2D: p. 247 two limit cycles polar form" in "PerkoExs." 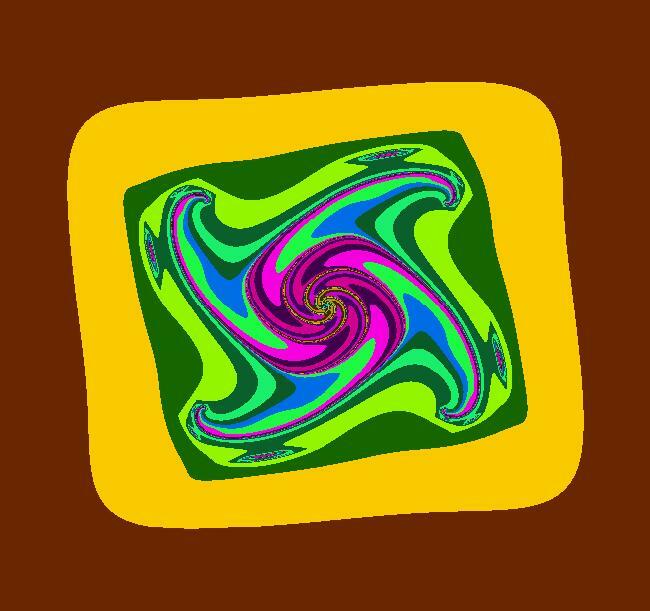 View/Sys/Gal: Ode "2D: p. 247 two limit cycles polar form simplified" in "PerkoExs." View/Sys/Gal: Ode "2D: p. 249 (x-y-x^3,x+y-y^3)" in "PerkoExs." 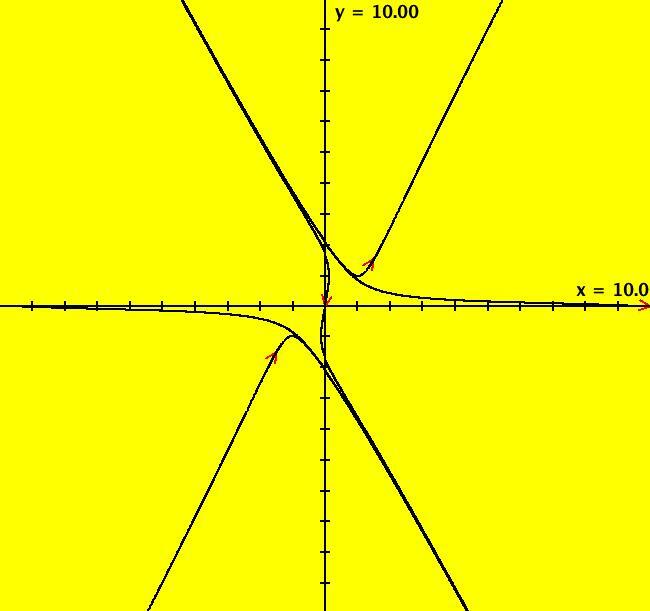 The finite fixed point is (x,y) = (0,0). that is, the terms of degree 3 on the on the right hand sides of the system. v*P3(u,v) = u*Q3(u,v), u^2+v^2 = 1. In the 3D/(t,x,y) view, we see that the period of the limit cycle is about 7. View/Sys/Gal: EMap "2D: p. 249 (x-y-x^3,x+y-y^3) EMapCT5" in "PerkoExs." View/Sys/Gal: Ode "2D: p. 272 (x^2+y^2-1,5*(x*y-1))" in "PerkoExs." There are no finite fixed points. which give Perko's global phase portrait figure 7 on p. 274 in the R2+ view. Note that all terms of P and Q are used, not just the highest order terms. which are Perko's equations (8), p. 273. This 2D system can be studied in OdeFactory as a 3D system by adding the equation dx/dt = 0 and using the (y,z) view with x(0) = 0. See system "3D: p. 273..." in this gallery. See the next system for an analysis of the flow at infinity using the dy/dt, dz/dt equations in OdeFactory. 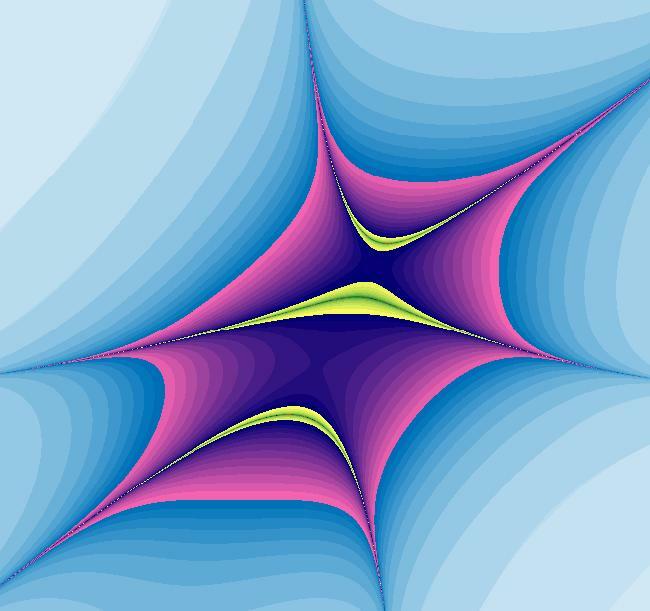 View/Sys/Gal: Ode "2D: p. 276 (-y*(1+x)+a*x+(a+1)*x^2,x*(1+x)), a=.2" in "PerkoExs." where 0 < a < 1. Perko, p. 276, fig 9. 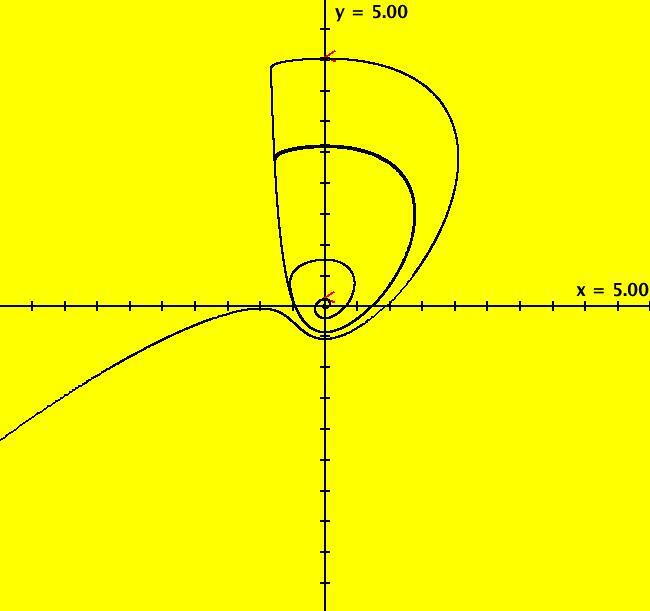 There is a finite fixed point at (x,y) = (0,0) and there is a limit cycle about the fixed point. To see the limit cycle get into the R2 view, clear the view and start a flow animation with 5 dots and max speed. Click the "Start Flow" button to add dots while the animation runs. The R2+ view shows the global phase portrait. View/Sys/Gal: Ode "2D: p. 292 (a*x-y+(a+1)*x^2-x*y,x+x^2), a=.5" in "PerkoExs." 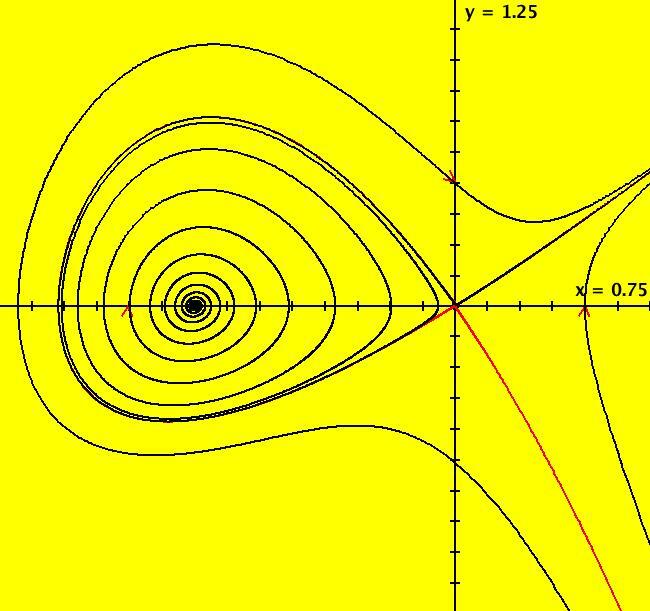 For -1 < a <= 0 (0,0) is a spiral sink and for 0 < a < 1 there is a limit cycle about (0,0). The limit cycle is a separatrix. 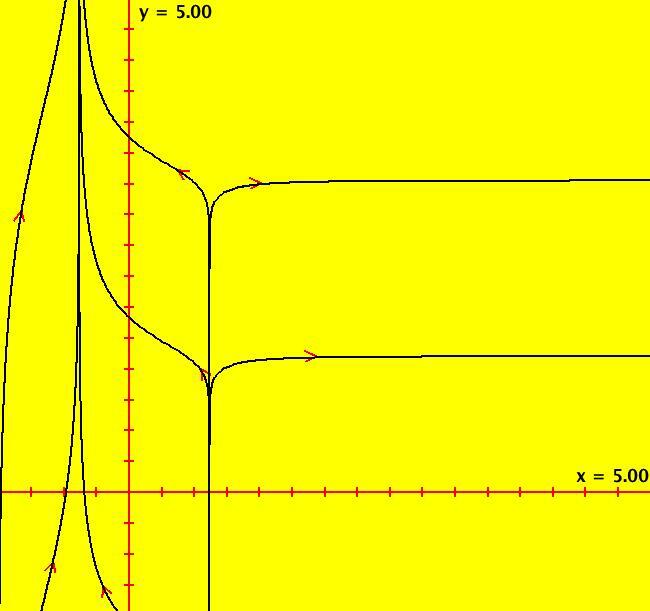 The bifurcation value is a = 0. View/Sys/Gal: Ode "2D: p. 320 (y,a*y+b*x*(1-x^2)), a = -1.10; b=1 ver 2" in "PerkoExs." 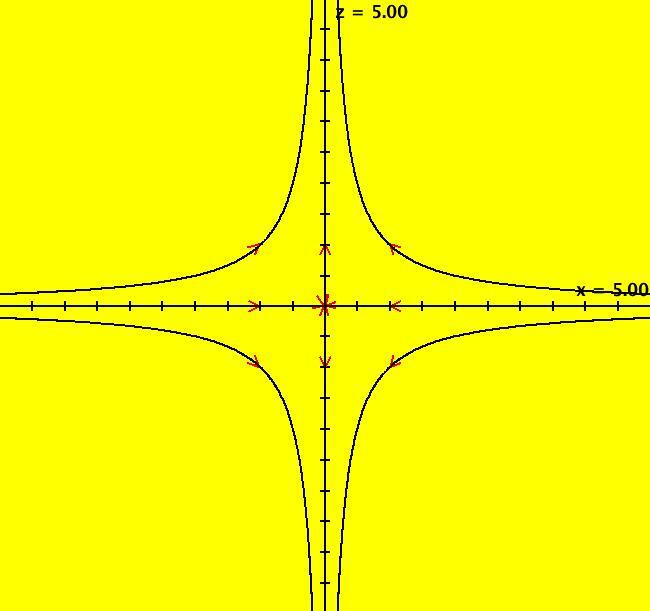 in the (x,y,y') coordinate system. 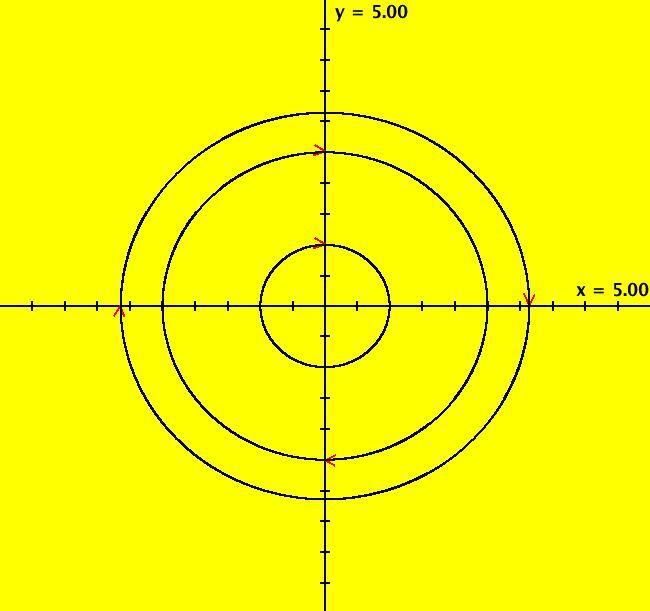 View/Sys/Gal: Ode "2D: p. 320 (y,a*y+x*(1-x^2)), a = .30; " in "PerkoExs." ICs at (0,0) are: (0,+-.001). There are separatrices for all "a" but there is only a separatrix cycle for a = 0. The same is true for the damped pendulum. Try both the R2 and R2+ views. 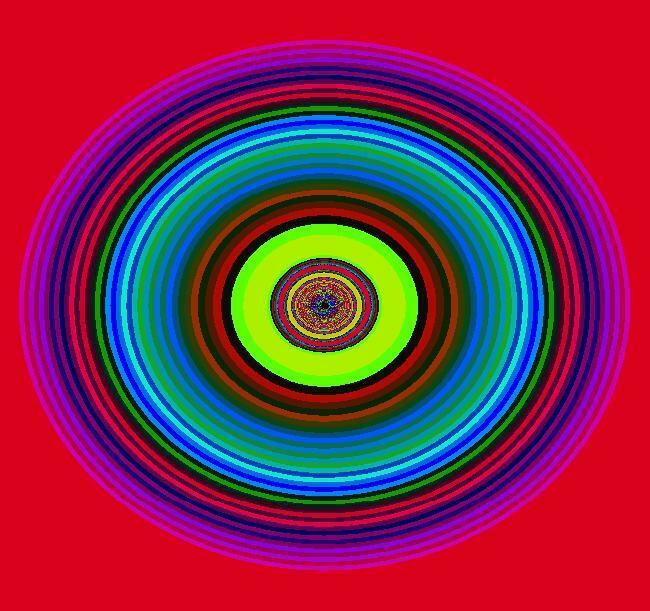 View/Sys/Gal: Ode "2D: p. 392 (y,x+x^2-x*y+a*y), a = -.864; " in "PerkoExs." The finite fixed points are at (0,0) and (-1,0). This is a difficult system to draw a separatrix for. The IC for the approximate separatrix is (0,-.001). Other ICs are: (0,.5), (.5,0) and (-1.25,0). Delete the trajectory starting at (-1.25,0) for a better view of the approximate separatrix. Pan right until the fixed point is centered in the view then zoom in until you to see the error in the approximate separatrix. Adjust "a" to see what happens. Try the EMap view with a = +-.04, -.27. View/Sys/Gal: EMap "2D: p. 392 (y,x+x^2-x*y+a*y), a = -.864; EMapCT3" in "PerkoExs." 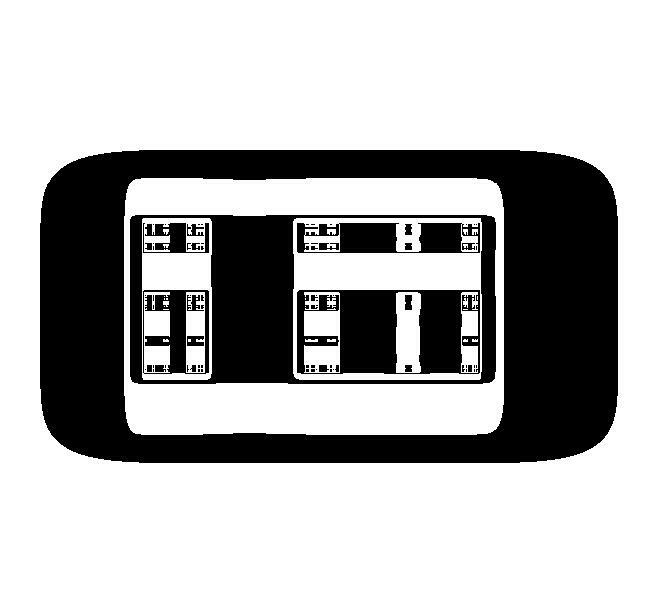 View/Sys/Gal: Ode "3D: p. 53 (-y,x,z/5)" in "PerkoExs." This is Perko's fig. 2, p. 53. The fixed point is at the origin. 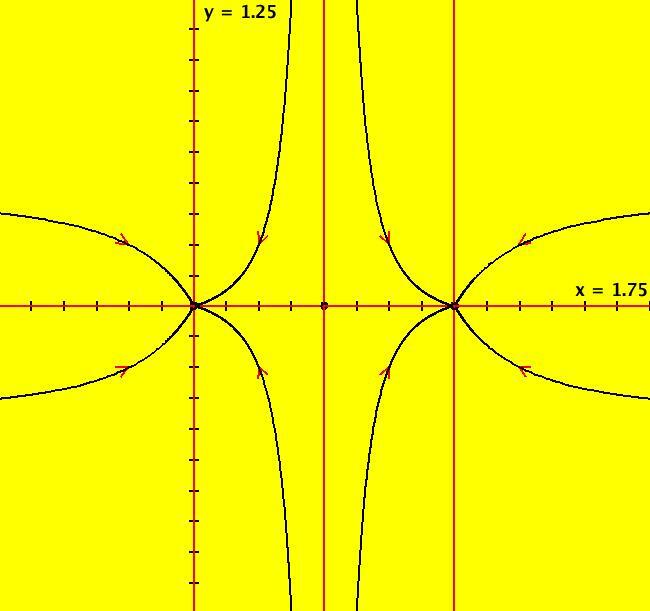 The center manifold, Ec, is the (x,y) plane. The unstable manifold, Eu, is the z axis. View/Sys/Gal: Ode "3D: p. 105 (-x,-y+a*x^2,z+a*x^2), a=0" in "PerkoExs." and the unstable manifold is the z axis. The (x,z) view is in the (x,0,z) plane. Watch what happens as a -> 1 and as a -> -1. 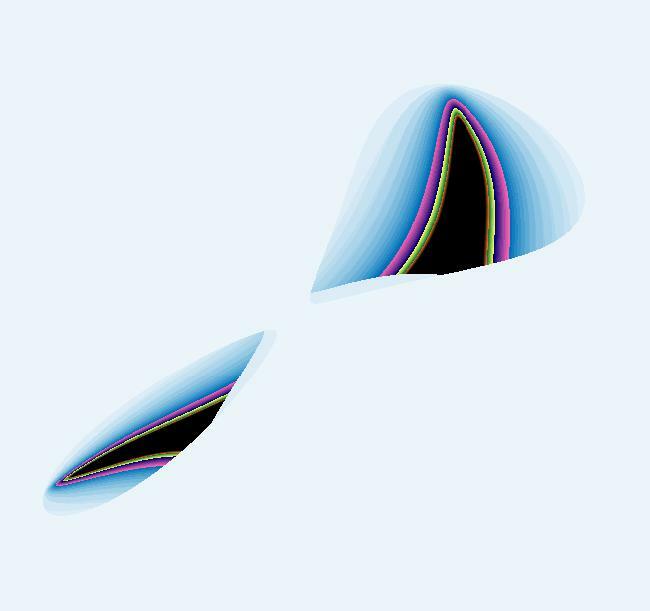 View/Sys/Gal: Ode "3D: p. 105 (-x,-y+x^2,z+x^2)" in "PerkoExs." Stable manifold is the surface z = -x^2/3. Unstable manifold is the z axis. The view is in the (x,0,z) plane. The y axis is into the screen. View/Sys/Gal: Ode "3D: p. 273 (0,4*y-5*z^2-y^3+y*z^2,-z-z*y^2+z^3)" in "PerkoExs." onto the top half of the Poincare unit sphere in R3 and then onto a plane tangent to the unit sphere perpendicular to the y axis. The dy/dt, dz/dt equations of the 3D system are used to study the "flow of the 2D system at infinity." 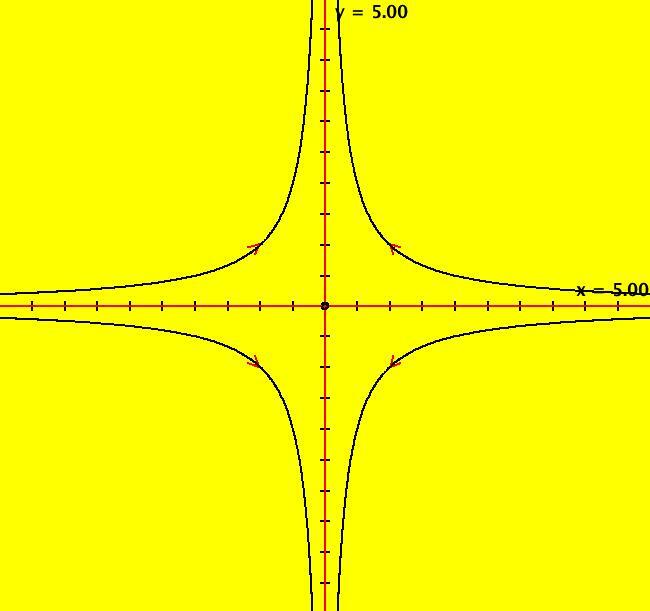 The - sign is used to get the correct direction of the flow at infinity (on the unit circle in the R2+ view). 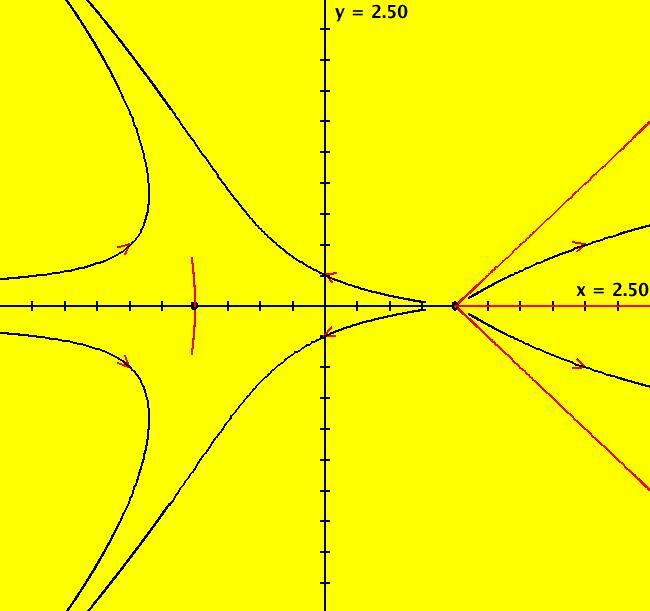 The (y,z) view, with x = 0, gives Perko's, fig. 6, p. 273.